Fiscal Futures: Does the Expansion of Foreign Debt Threaten Fiscal Transparency? This post is part of the Fiscal Futures blog series exploring some of the biggest issues that fiscal accountability enthusiasts are likely to encounter over the next 10 to 15 years. Learn more about the Fiscal Futures project and download resources here. In 2012, an Argentinian ship was impounded in Ghana as part of a dispute between a U.S.-based hedge fund and the government of Argentina. The hedge fund owned more than one billion dollars of Argentine debt and claimed the ship as partial repayment. This particular hedge fund was part of a growing number of ‘vulture’ funds that buy sovereign bonds at prices sharply below their face values when governments face financial challenges and then demand that governments repay the debts at the bonds’ original prices. 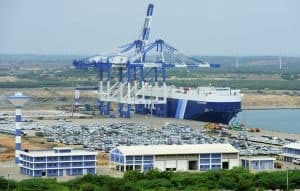 More recently, Sri Lanka had to cede a major port to China for 99 years after the country struggled to make payments on debt it owed to the Chinese. This was not the first case of China using concessional loans and aid as a strategy to gain geostrategic assets in other countries. In late 2018, Kenyan news outlets reported that China may take over the country’s largest port in Mombasa due to the country’s inability to pay off a loan it obtained from China. The cases of Argentina, Sri Lanka, and Kenya are symptomatic of a potentially dangerous trend in which emerging economies are raising money by incurring high levels of debt from non-traditional sources. As official development assistance in the form of grants and aid dwindles, and as traditional donors increasingly emphasize the need for countries to expand domestic resource mobilization, debt offers an alternative source of funds for governments that do not wish to raise taxes in the near term. This is especially attractive to governments that believe increases in tax rates could imperil their ability to stay in office. Between 2008 and 2017, external debt held by low- and middle-income countries has more than doubled, rising from approximately $3.4 trillion to more than $7 trillion. Low- and middle-income countries are increasingly borrowing from the private sector and from bilateral sources, particularly China. External debt commitments by private lenders (such as commercial banks and bond holders) to low- and middle-income countries increased by a trillion dollars between 2008 and 2017. By one estimate, 20 percent of the outstanding external debt of African governments is currently owed to China. There are several reasons why debts owed by developing countries to private lenders have increased. First, in the wake of the global financial crisis, governments increased borrowing to finance fiscal stimulus measures in order to sustain economic growth and avoid political unrest. Second, the global financial crisis spurred central banks in the developed world to cut interest rates sharply, prompting private investors to seek higher yielding investments in emerging markets. Emerging market countries responded by increasing their borrowing from external sources and by marketing local debt to foreign investors. Emerging market governments often found it attractive to raise money by issuing bonds because they did not have to meet conditions usually imposed by official lenders such as the International Monetary Fund (IMF) and the World Bank (such as imposing austerity measures or implementing institutional reforms) to obtain debt from external sources. In some cases, governments have raised additional funds and kept their official debt relatively low by arranging for state-owned enterprises (SOEs) to issue debt. While the finances of SOEs are often opaque, in many cases, private investors have been reassured by implicit and occasionally explicit sovereign guarantees. For example, the secret and unauthorized ‘Tuna Bonds” issued in Mozambique by an SOE were implicitly guaranteed by the government and subsequently almost bankrupted the country. In some cases, countries have even arranged private deals with small groups of wealthy investors. What are the risks for fiscal transparency and accountability? Increased borrowing from non-traditional lenders brings significant new risks. Undoubtedly, in the short-term, Chinese loans are attractive to countries that are unable to access international capital markets, or that like the high levels of secrecy that such loans afford, or that have poor human rights records that might impede their access to other sources of financing. But in the long-term, as the Sri Lankan and Kenyan examples show, defaulting on such loans might allow China to extract steep economic, political, and military concessions from debtor countries, including control over local industries, low-price oil deals, and naval basing rights. Similarly, money borrowed from private investors also brings risks. It is often harder to restructure debt held by numerous private investors than debt held by a handful of multilateral organizations like the IMF and World Bank. Further, as the Argentina example shows, defaulting on debt held by private creditors can result in lawsuits and the seizure of an issuer’s assets around the world. How should civil society respond to the increase in debt? Fiscal transparency advocates need to pay more attention to the composition and levels of debt in developing countries as they are likely already impacting the willingness of these governments to become more transparent and accountable to their citizens. If countries continue to borrow from China, they may be less motivated to respond to citizen and civil society demands for transparency in public finances. In this context, civil society advocacy efforts could focus on publicizing the potential long-term negative consequences on national assets and security of borrowing from China. Popular mobilization efforts could be supported to demand more transparency around loans from China. Transparency advocates could also point to the need for their governments to plan ahead in case China’s international lending operations are curtailed as a result of a banking crisis. Similarly, fiscal transparency advocates could point to the dangers of over-dependence on loans from private investors who might not agree to soft bailout packages to help countries that default on debt. Advocates could also highlight research, such as the recent IMF study, that links higher levels of fiscal transparency with better and cheaper access to private funds. They could also solicit leaders from investment funds focused on Environmental, Social and Governance concerns to advocate for fiscal transparency and offer incentives in the form of access to their funds. The increase in low- and middle-income countries’ borrowing from the private sector and China, relative to official lending, has negative implications for the fiscal transparency of emerging market governments in the near term. Although private funds may be able to support transparency reforms under some circumstances, it is unlikely to be the norm. Ultimately, emerging market governments may come to realize that it is in their long-term self-interest to improve fiscal transparency, reduce deficits, and implement needed reforms. However, fiscal transparency advocates cannot wait for governments to come to this realization on their own. They must mobilize their efforts and draw attention to the clear dangers of the current trends in debt. The good news is that civil society organizations have a successful track record of engaging on debt-related campaigns. Civil society advocacy in the 1990s played a key role in the institution of the Heavily Indebted Poor Countries Initiative that provided debt relief to many countries. Some of the same groups that were involved in advocacy efforts two decades ago are now calling for rules that will promote more responsible lending and borrowing practices involving low- and middle-income countries. This seems to be an opportune time for fiscal transparency advocates to develop alliances with debt relief specialists and implement targeted strategies that will promote transparency and accountability around government finances and debt while supporting the ongoing effort to demand that countries increase transparency around all aspects of their budgets and provide increased opportunities for citizens to participate in formulating national budgets. Fiscal Futures: Will China Offer an Alternative Development Model?